In 2017, our AGM and Members’ Meet up was held at The Station in Bristol. The Station is a former fire station in Bristol city centre, which is operated as a social enterprise by Creative Youth Network, a registered charity that aims to help young people reach their potential. As well as being a youth hub, The Station is home to a number of community youth projects. We received lots of really positive feedback from our members about the day including particular praise for the catering provided by the café at The Station which is run by the YMCA. Overall voting turnout was 16.17% – a slight increase from last year, and 54% used our online voting service which was a big increase from last year and helps us reduce the amount of paper we use. We’re always trying to get more members involved in voting, if you’re a voting member, please use your democratic power in 2018! 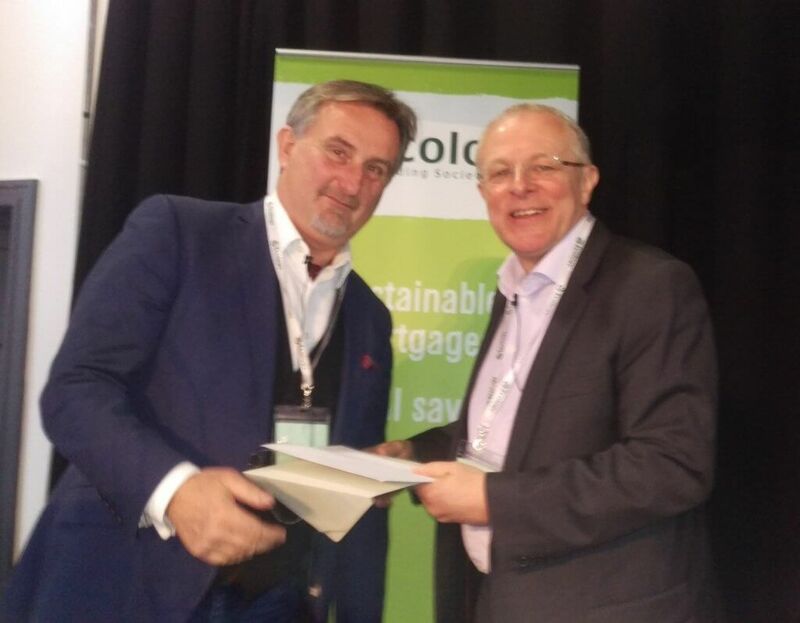 At the end of the morning Paul Ellis was presented with a gift by Steve Round in recognition of his 25 years service at Ecology, including nearly 22 years as Chief Executive! In the afternoon members also had a sneak preview of our new animation which we commissioned to help explain and promote how we use money for positive benefit by supporting buildings and projects that respect the environment as well as community-led and affordable housing. Anna Kear, Executive Director of UK Cohousing Network then explained how Ecology is helping to support community-led housing move into the mainstream to respond to the housing crisis. Chris Sunderland, Executive Director, Real Economy (Bristol) Ltd then shared his experience of helping to found the Bristol Pound as a leading example of local democratic finance. He went on to explain how he is now setting up a community food centre as a radical intervention to make Bristol an earth friendly city. In our Sustainable lending in practice session later in the afternoon members heard how Ecology borrower and CEO of the Association for Environment Conscious Building undertook an extensive renovation and retrofit of an old railway cottage in Hereford to Passivhaus EnerPhit standard to create a comfortable energy efficient family home. In the final afternoon session, Your Society, members participated in more intimate smaller breakout groups and willingly shared and discussed their ideas for how Ecology can grow its role in building a greener society, including developing partnerships with like-minded organisations, promoting literacy in sustainable finance and campaigning on housing standards and national insulation schemes. And, another member commented: ‘“As usual, very informative and inspirational. Especially enjoyed the [small] groups in the afternoon’ and another commented: ‘It means a lot to me that there are companies in this world who hold similar ethical values to myself’. We will be seeking approval for the Minutes of this year’s AGM at the next AGM in 2018.